Had your fill of short and fragile copper cables? While making tracks is fun, storing, cataloguing and transferring the ever-increasing amounts of data associated with them is not. Fortunately, there's a new development for those in pursuit of uncompromising hardware, courtesy of US firm Corning. Its line of Optical Cables, now available in the UK for the first time, takes the convenience of established copper-cable connections (e.g. USB and Thunderbolt) and converts the data to an optical signal. The result is the incredibly fast transfer speeds of Thunderbolt and USB 3 between computers and external hardware with a durability and at lengths that makes copper cabling look, well, like a relic of the Edison-era. Currently Corning reckons USB users will find they can shift data up to an impressive speed of 5GB a second, while those that have untapped the full potential of Mac-based Thunderbolt connections will benefit from four times that - with an astonishing max speed of 20GB per second between compatible devices. While this is not the kind of good news we recommend you share at dinner parties, the potential benefits for anyone working with large file sizes - music-makers and video editors, we're looking at you - are obvious. Video and data can be sent along a single cable, while suddenly that 4TB backup you'd been saving to run overnight can be dealt with in the time it takes to check your emails. Beyond that, those of us that have fallen prey to compact, shiny laptops with tiny SSD drives could find that working in the studio and writing straight to an enormous external drive is far more feasible. Likewise, using external hardware, e.g. audio interfaces, should be much less of a headache, with the ability to daisy chain up to six Thunderbolt devices. Corning says that thanks to its active optical cable (AOC) tech the Optical Cable is also capable of maintaining its impressive speeds over much longer distances - up to 20 times that of the copper equivalent. This is something that we anticipate will, quite literally, be music to the ears of studio techies looking to run fast shared networks across significant distances, e.g. between multiple recording environments and control spaces in a multi-roomed complex. Additionally, these cables are both lightweight, incredibly thin and far tougher than their copper counterparts. In the chaos of creation, all it takes is a roll of a studio chair across a misplaced copper cable to halt proceedings, set your recording back and lose a moment of inspiration. It's a scenario annoyingly familiar to those of us beholden to technology in a whirlwind production environ. Optical Cables, however, are up to 50 per cent thinner and can be rolled over, tangled, tied in knots and pinched, without risking failure. All in all, our inner-techie is very excited. 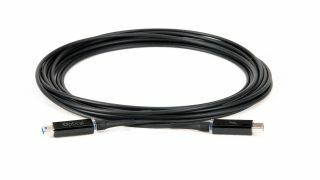 If you're interested, head to OpticalCablesByCorning.com to find a local retailer.